A week ago I went to a class called Bread is broken-lets fix it. Run by Dust Bakery at the Glebe Tramsheds in Sydney. It was good to meet Chef Cesare and listen to him speak quite honestly about bread, flour, grains and all topics involved with bread making, and at the same time maintaining a light and enjoyable eye opening class. I took a whole KG of their flour home with me and so I’ve been experimenting with it by making muffins and other baked treats. I’ve added a recipe below, but before we get into the recipe I wanted to share with you all some of the information I learnt from the class at Dust Bakery. Maybe it will inspire you to visit their bakery and join their class or even do some of your own research about good bakeries in your city. Let me know your thoughts below and any good bakeries that you guys love! I think it’s definitely more common these days to find a good quality loaf of bread in bakeries and retail stores. We have come a long way from the plastic white bread that is commonly known as ‘wonder white’. But if we take a closer look at the breads we eat, they are STILL a far way away from what bread actually used to be like. What happens before the dough is made and baked? This class makes you question the way that the grain of the flour is grown – Is it heavily sprayed with pesticides and chemicals? the way that the grain is then processed into flour – is it roller milled or stone milled? and then whether the dough is fermented or prepared in some other way. Here is an overview of Dust bakery, their values and information that they are trying to share. Chef Cesare spoke openly and honestly about the history of how bread making has changed. 5000 years ago: Bread was first made in Egypt thousands of years ago made with whole wheat, stone ground flour. 2000 years ago: As stone ovens were invented, the making of bread all began to change. Stone mills became the centre of communities, breads were naturally fermented, then baked in huge stone ovens. 1000 years ago: It was estimated that there was one stone mill for every 300 people in England. 1880: Roller milling was invented – helping to produce a more refined and whiter flour. This technology then took over US and the Western world. 1857: Commerical yeast was created….therefore natural fermentation that is so crucial to our health and digestion for bread was skipped and commerical yeast was used instead. BOK Grain and why do Dust Bakery use it? BOK grain is one of the only heritage Australian wheats available which was originally created to use as a main grain for grain blends. Dust Bakery use BOK grain that predates the 1960’s and actually was nearly extinct until it was recently regenerated over the last 3 years. Dust bakery use BOK grain throughout all of their breads, pastries and cakes and it is stone milled on site (you must check out their stone mill next to the bakery – very impressive!). They have chosen a grain that is nutritious, unique and produced organically for a better end product. It produces a flour which retains the highest levels of flavour and nutrition. The germ, bran and endosperm of the wholegrain are all retained. It allows them to work directly with organic australian farmers to source the best sustainable grains they can find. Can you guess how many stone mills we have in Australia currently? 10 stone mills for our population. This means most of the bread that we eat is not stone milled. When we look back at history knowing that in England you would find 1 stone mill for 300 people, it truly shocks me how an industry can change. 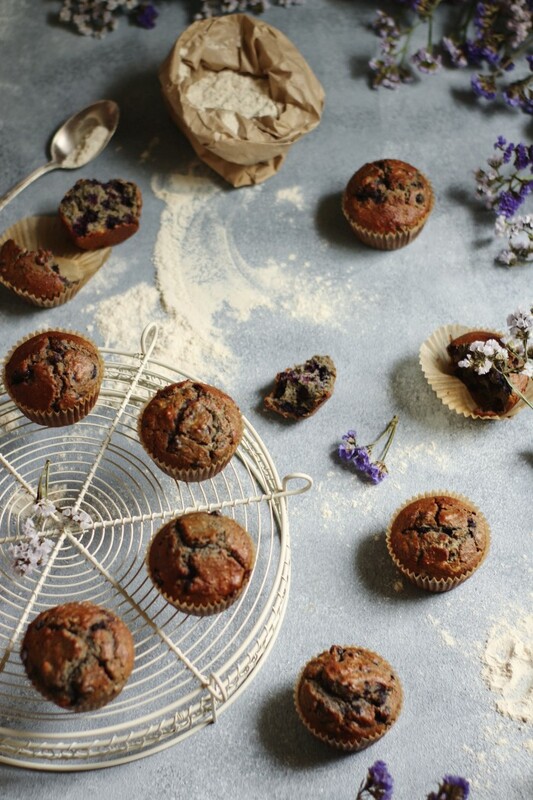 These muffins are made using the BOK flour from Dust Bakery. It’s good to add some kind of meal like almond meal or hazelnut meal to this recipe in order to add slightly more texture, rise and ‘fluff’ to the muffin. In a large bowl using your hands mix together the flour and butter until a crumblike consistency, then add the meal, sugar, and mix well all together. In a separate bowl add the milk, eggs, baking soda and vinegar and whisk together. Then add the blueberries. Pour this mixture into the flour mixture and using a wooden spoon or spatula combine together. Bake in lightly greased muffin cups or muffin tin for 15 minutes or until golden brown. You can use wholemeal spelt flour or buckwheat flour instead of BOK flour as an alternative. If you like sweeter muffins you can add another 1/2 cup of some sugar. I used frozen wild blueberries but you can use fresh, or even other berries as an alternative.